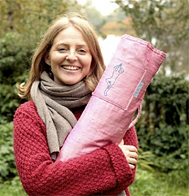 Amy Ku Redler trained in India, Thailand and the UK. Amy credits her training with Asokananda and Mary Stewart as a core foundation and inspiration for her own work of over twenty years teaching yoga, Thai massage, meditation and Pilates. Her work covers a broad field. She teaches in five-star spas; with rehabilitation groups; for corporations that include Sony IT, BBC and the Scottish Government; at Morley College; and at the College of Thai Yoga Massage, where she is director. Amy has had featured articles about her work in The Times, Vogue, Evening Standard and Time Out. She has spoken about her work on BBC radio and given yoga sessions at press launches for Calmia boutique in Marylebone High Street and Harrods. She has a busy practice in London, is currently studying for her MA at SOAS University in the traditions of yoga and meditation, and doing a postgraduate training course in Pilates equipment with Anne-Marie Zulkahari.